Good architecture should evoke emotions. Blue Orange, a comprehensive wellness center in Letňany, intentionally uses restrained architectural means and carefully planned combinations of materials to achieve optimal mind and body affinity. 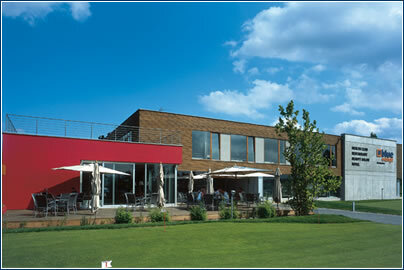 The two-floor building, designed by Luděk Rýzner, makes “friendly places” of all parts of the restaurant, hotel, conference room, health club, and beauty salon, providing interesting transparency for daylight and the outdoors environment through peaceful atria, terraces, balconies, and flat roofs with greenery. 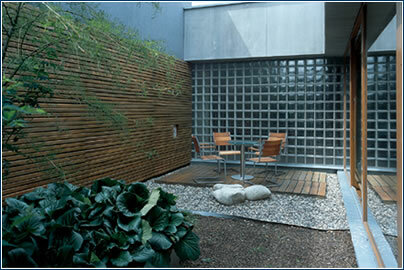 Contact between the outdoors and the indoors results in ultimate relaxation in the atrium in front of the beauty salon. 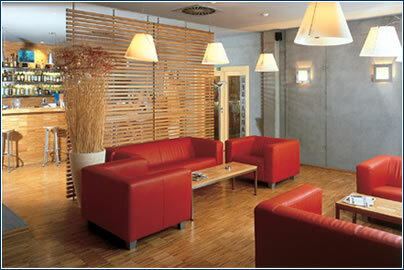 The red color of the environment underlines the clubby character and cozy surroundings. 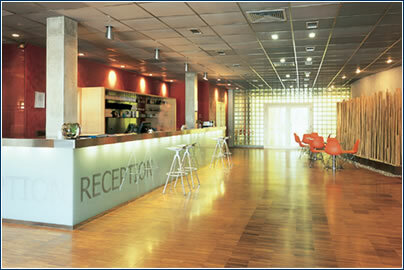 The entrance hall and reception area embodies the building’s motif: warm and cold elements combined in terms of materials and colors. 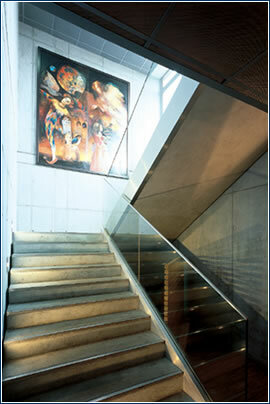 Raw poured concrete combines with sleek glass railing. 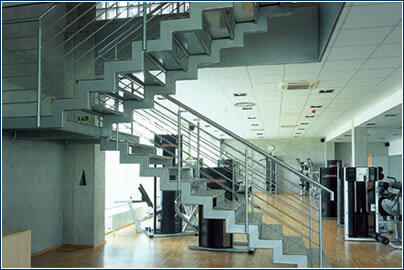 The subtle metal stairway stresses the technical nature of the fitness hall. 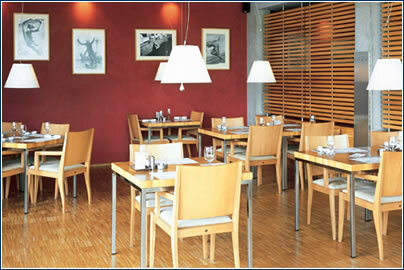 Despite its rich menu, the restaurant’s interior looks healthful and austere. 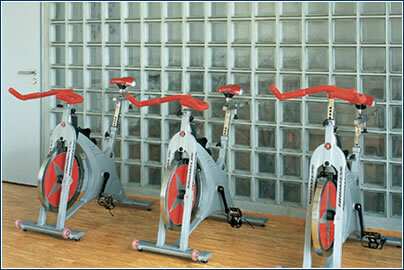 The air-conditioned physical condition and graceful body laboratory with state-of-the-art Schwinn stationary bicycles. Besides sophisticated services, Blue Orange offers activity and relaxation in a technically advanced, well laid-out health club with cardio fitness, a stationary bike studio, and four squash courts. What is the philosophy behind Blue Orange’s architecture? Architectural means shouldn’t pay homage to the era. So we used unobtrusive materials that will never go out of fashion and be obsolete. Some of them, such as fair-face concrete, glass, and wood, are left in their natural form. The effort to combine traditional materials in untraditional ways was the rule. To make the structure’s atmosphere to be balanced and pleasant, we chose combinations of warm and cold colors, as well as materials that evoke coolness or warmth. One should feel good in such a club. What role does architecture play in your investment plan? We want to create a chain of clubs that mainly provide active relaxation – centers that attract clients as pleasant, friendly places to relax as well as offering social and business contacts. There is currently a lack of such places on our market. We selected architecture to further our plan: we needed large, modern spaces that would look attractive, and materials and shapes to create a motivating, inspirational, “friendly place”. The club should offer visitors a full lifestyle.